The second annual Alianta Awards Gala took place in the glitz and glamour of Washington, D.C. on October 7, 2015, across the street from the George Washington monument in the Organization of American States (OAS) headquarters. The president of Alianta, the now retired U.S. Ambassador to Romania, Mark Gitenstein, made remarks that emphasized the long connection between the two countries and the desire of this organization to mutually advance the arts, sciences, business, and security. “Giving Back” programs are shaping up in three categories: entrepreneurship/business, culture/art, and science/health. The evening’s guests included government officials, former ambassadors, academics, politicians, TV personalities, entrepreneurs, and religious leaders. They were called upon to raise Romania’s profile in the U.S. by sharing their expertise and success. As Romanians, we are proud of our heritage and feel honored to share our collective and individual experiences with others. The current Ambassador of Romania to the United States of America, George Cristian Maior, spoke about the successes and opportunities of growth in the future. The U.S. representative, Mike Turner (R-Ohio), the Romanian Congressional Caucus co-chair, made brief remarks on the effort to strengthen the ties between communities and the two countries. Two curators, Sonia Coman and Ramona Todoca, presented their own art and designs and various artistic mediums as the message of many painters, sculptors, and visual artists. After the meet and greet reception in the lovely atrium of the Organization of American States (OAS) building, the gala participants were directed upstairs. 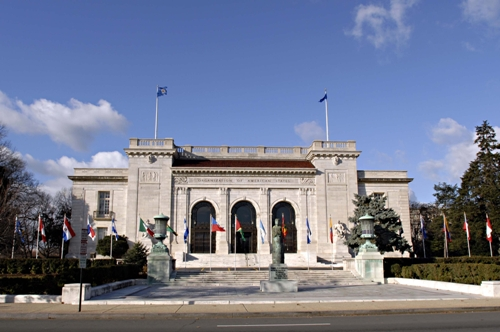 “The architectural wonder of its time,” built in 1910 with a tropical patio, marbled staircases, galleries, and monumental halls, the OAS mansion houses the world’s oldest regional organization of 35 countries from the Americas and the Caribbean. During dinner, the 2015 Alianta award recipients, Dr. Adrian Bejan, Radu Georgescu, and Robert D. Kaplan, had an opportunity to give brief speeches. Dr. Adrian Bejan, the J.A. Jones Professor of Mechanical Engineering at Duke University, has been ranked among the world’s 100 most highly cited authors in engineering since 2001 on the topics of fluid dynamics, thermodynamics, and heat transfer. He recently developed the Constructal Law of organization and evolution in nature. 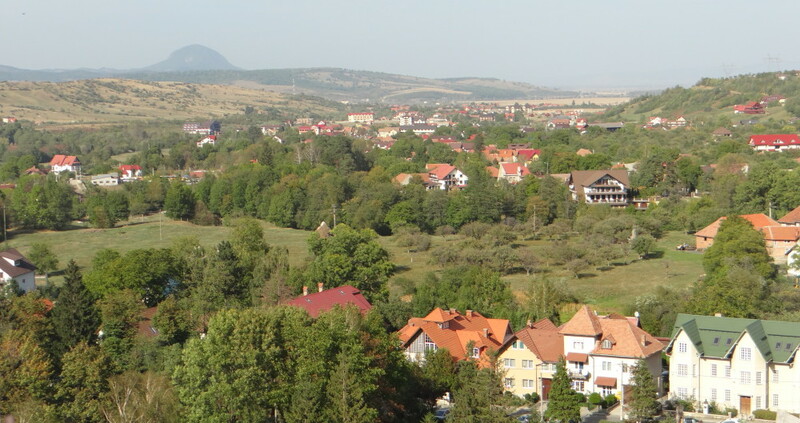 The author of 28 books and 600 peer-referred articles, Dr. Bejan spoke about his parents who were able to educate themselves and achieve success in the pre-era of communism, when Romania was a free society. He emphasized freedom as an enabler of his success in the post-communist era. Radu Georgescu, a software entrepreneur since the early 1990s, founded the GECAD Group which focuses on investing in software and high-tech companies in areas of security software, e-commerce, and cloud technologies. He launched the RAV Antivirus which was purchased by Microsoft in 2004 and Avangate, which was sold to a U.S. private equity firm. In 2003 he received the National Order “Romania’s Star” from the President of Romania. Robert D. Kaplan, bestselling author of 15 books on foreign affairs and travel, visited Romania in the 1970s and returned in 2013 and in 2014. He will release his newest book in 2016. He spoke about his travels and his impressions of the former communist Romania and the current Romania. The Alianta Gala celebrated in style the Romanian-American non-profit alliance and honored the achievements of citizens who contributed to the 125 years of fruitful collaboration and diplomatic relations between the two countries. This entry was posted in Life and tagged Alianta, Ambassador of Romania, art, awards, culture, Dr. Adrian Bejan, former U.S. Ambassador to Romania, gala, GECAD Group, George Cristian Maior, health, Iuliana Niculescu, Mike Turner, non-profit organization, OAS building, Radu Georgescu, Ramona Todoca, RAV AntiVirus, Robert D. Kaplan, science, Sonia Coman by Admin. Bookmark the permalink.